If you knew that there was a very high probability of developing cancer in a part of your body you could live without, would you have that body part removed? Fortunately, for most of us this is a dilemma we rarely face. Sadly, for owners of female rabbits this is a genuine conundrum. Once a female rabbit reaches the age of 4 years the incidence of uterine adenocarcinoma (womb cancer) can reach 80%. The fact remains that if you own a female rabbit then the question you are facing is not so much, will your pet develop cancer, but when? The only viable option to consider is surgical removal of the uterus (hysterectomy). Whilst any surgery of this kind involving a full general anaesthetic carries some risk, with the development of increasingly safe anaesthetic drugs the odds are considerably more favourable. At Fairfield, our designated "rabbit vet" Aga carries the responsibility of improving the health and longevity of pet rabbits like "Bramble". 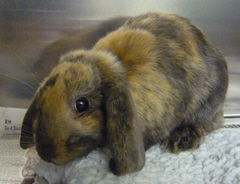 Having safely recovered from her operation "Bramble" can concentrate on navigating her way through the more well known obstacles, such as a poor diet and lack of exercise, to a long and healthy lifestyle in domestic rabbits. With "Bramble's" owners already so well informed her future looks hopeful!